Florida Outdoors RV decided to put together a list of some of the best RV blogs on the World Wide Web. There are 1000s of dedicated RVers and 100s of those blog on a regular basis. Thanks to the Hitch Up and Go website for already compiling such an extensive list! We've gone through dozens and dozens of blogs. We have come up with some of the best RV Blogs in the industry! Those who are picked can proudly 'wear' the "Top 50 RV Blogs of 2013" badge on their website! We love to see people who regularly share their stories while on the open road. 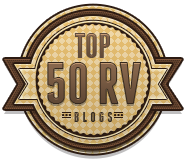 We are excited about the launch of the very first "Top 50 RV Blogs!" We based our decision on a couple of factors. Blogs didn't have to meet all of them, but did need to meet at least one. We tried to stay away from RV industry (business) blogs as well. If you see your RV Blog listed, feel free to add the badge above to your blog! Here is some handy HTML code to make it easy for you! Make sure to share this page on Facebook and Twitter! This blog follows the adventures of a young family from Canada, Derek and Teresa with their daughter Cassia and hound Rufus as they travel North America and even Mexico! They believe in living the "simple life" and do it quite well in their van and small trailer all while living on about $20,000/year. Teresa is also very knowledgeable on how to live on healthy food. Young families on the road is a great inspiration to the RV lifestyle! Aluminarium is about a young couple and their pet dog who started RVing or Airstreaming in 2005 after restoring a 1963 Airstream. They traveled for two years before upgrading to a new 2013 Airstream. They share their adventures regularly on their blog, Facebook and Twitter. They are also vegan and so some of their blog is dedicated to different vegan restaurants and recipes. Here is another Airstream family who decided to sell the house and buy a vintage travel trailer, fix it up and hit the road in Australia. They even bought another Airstream and started their own Pizza business, Happy Camper Pizza. With nearly 2,000 fans on Facebook, this family is beginning to have quite the following! The BoyInks are a family of four that travel in their fifth wheel RV. They support themselves by working on the road (web design etc). Mike and Crissa have two kids, Harrison and Storybird and share their adventures detailing everything from stories, their fifth wheel RV (Wildcat) to their finances. Mark Johnson, also known as The Wanderer, shares his journey through words and pictures. Mark takes beautiful photos of the places he journeyu2019s through. His pictures are made even better through his adventures in hiking and biking. He loves keeping his blog current and active through engaging conversation. Follow Jim and Bobble Chapman as they explore the great North American roads in their RV. They are originally from Colorado and share their travel stories and pictures on the blog. Their Poncho or 'Beanie' is their constant companion. Bob Wells has done a fine job of teaching people everywhere how to RV for cheap. Heu2019s been living in a converted van himself for over 10 years! When you visit his blog, he doesn't waste any time showing you how to go RVing for cheap. If you're serious about it, he certainly has the knowledge to show you how! He has also written a book on the subject. This blog is about a Class C Sunseeker owner and her dog Katie. They are full timers since June 1st, 2011 and enjoy the lifestyle. She regularly blogs about the events of her life. They even do some boondocking with her newly installed solar panels. She has a great post about the whole process! The Creative Cruiser is all about the rebuilding of a 1963 Starline Flxible Bus. You will love all the great pictures and attention to detail that Ben and Karen Willmore bring to their blog. They are a truly creative and fun couple. They don't stay in one place for long and love the call of the road! Pat and Cindy are living their dreams. Ever since they were young, they always wanted to go RVing. After years of waiting and dreaming (including careers in the medical world and restaurant ownership), they finally took the leap. They now make their way around in a travel trailer telling stories through photography and writing. Shannon and Brian's goal is to see everything at least one! That's a lofty goal. However, they are doing a great job. While they do own an RV, they donu2019t limit their travels to where the road can take them. They are also a great resource on finance, money, health care, backpacking and more for travelers. Shannon has even written her own books! Kimberly and Chris first started their journey in a pop up. They entered the RV lifestyle with passion and fervor. After finding a lack of resources and community for young family RVers, they started Full Time Families where they are a great resource for the full time family! Geeks on Tour is a team of two that travel and educate the RV community on everything RV! Chris and Jim are experts in their fields helping RVers with the ins and outs of digital photos, running their own blogs, smartphone usage and so much more! They offer both free and paid resources. Their YouTube videos are also very informative. The Geeky Explorers found their love of RVing when they realized they had collected too much stuff in their lives and wanted to simplify. Keith and Tricia have the whole world in front of them -- wherever the road will take them! They support their lifestyle by doing contract work in the IT environment. They travel with their Class A RV, Crush and their dog Samantha. It wasn't hard to include Jason and Nikki over at Gone With The Wynns! They are some of our favorite bloggers. They regularly update their website with great videos, pictures and stories. They are known for their engaging location review videos, knowledge of 'green rving,' and attractive personalities. They recently upgraded from their beloved u'Winnie' (Winnebago) to 'Royu' (Fleetwood). Gr8Lakes Camper is updated and owned by Rick Kessler husband and father to his wife Angie and kids Hannah, Luke and Ben. They have been part time RVers since 2007 and consider their travel trailer a cottage. They have a rich family heritage of RVing. His blog is a great resource for the RV community. Nick, also known as "Bad Nick," manages the blog over at Gypsy Journal RV. They produce the Gypsy Journal Newspaper from the comfort of their RV, a Winnebago Ultimate Advantage diesel motorhome. Nick blogs on a wide variety of topics including RV tips, advice and stories. His wife (they recently celebrated their 16th year anniversary) also blogs some of her favorite kitchen recipes. The Hipster Gypsies are a fun couple who travel the great trails wherever they want in their 1998 Winnebago Rialta motorhome! They have a whole page dedicated to their RV and they give us a great tour of their living area, kitchen and more! It's very unique, just to them! [I love it when people use solar power.] Check out Aly and Christian in their adventures! I may have mentioned before, that I love when young families get involved in the RV lifestyle. AnnMarie and Jerry homeschool their kids with iPads, have a u201cany where I can get Internetu201d based business and live the Gospel of Jesus Christ. Their story is pretty incredible and is an inspiration to any family wanting to do the same! This blog is about the journey of a woman who bought a truck, a camper and took to the open road. Becky Schade believes that living your dreams now is important, and sheu2019s an inspiration to others who want to follow in her foot steps. She even tells us a little bit about how she makes a living while on the road. Her overview on the Amazon Camper Force is something new to me! Youu2019ve probably heard about the Kelloggs. They are a family of 12 that travel in their Class A motorhome pulling a slew of water toys behind them. I really enjoyed check out their website. All the Kellogg kids homeschool and have a lot of fun doing it! Just by visiting their site, you can tell they have tons of fun, especially through the lens of Susie's humorous blog posts. Kevin and Ruth lead one of the most exciting traveling lives youu2019ll find. While they currently are not RVing, they had been enjoying the RV lifestyle for quite some time. They are taking a break right now to travel South Africa. They document their adventures in a very detailed manner, even including their monthly budget. They also share a plethora of pictures! Join the rest of the nearly 1 million visitors. Life on the Open Road with Diana Tolerico is one of great fun, family and laughs! She takes you along her adventures of great places, special times with her grand kids and some of her social events with friends. She's been on the road 'boondocking' for 14 years. But she's still connected to the world through the Internet and powered by solar panels! Ingrid and Al have a truly compelling story. It's very much a romance story that begins and ends with the love of adventure and travel. The simplicity of their blog let's their stories and pictures shine even brighter. (note: Ingrid is a great photographer) Their blog is truly an inspiration. Jim and Rene left the corporate life behind them and took to the road in June of 2007. They now travel the United States supporting themselves through work camping, web design, jewelry making and writing. They've even put together a program to help other people make a living while on the road. PBS has also featured them in Nature, Why we Love Dogs and Cats! Ray is the official blogger over at Love Your RV. He and his wife sold their house, most of their possessions and make their way all over North America in a fifth wheel. They document their adventures on a regular basis. Ray is a huge supporter of the RV community and has even created a website just for people to share their stories and photos over at RV Happy Hour. His knowledge also extends to RV products, tips and advice. Hans, Lisa and their cat Rosie have just recently joined the RV lifestyle. On their blog, they share the process of moving from their house into a 2013 Keystone Montana 300RK. They love to go hiking, walking, biking and exploring. All perfect traits for the RV lifestyle! Their blog also has images of their adventures along with some campground reviews. Randy is like a philosopher on wheels. But not only that! He's passionate about poetry, reading, writing, dancing and self sustaining resources. His unique view on life will make you pause and think. Randy seeks freedom by fulfilling his dreams in his cozy travel trailer, all while meeting interesting people along the way. The New School Nomads are another young family who decided to join the RV lifestyle. While Jenn runs the majority of the blog, Brent supports their family with web design, internet marketing and more. They are also an official blogger over at the GoRVing blog. They have a great story and have a lot of fun doing what they love. David and Brenda are living outside their 'bubble' with their pets full timing in a Class A motorhome. Their blog posts are interesting, engaging and full of pictures! I especially like Davidu2019s quad copter videos. They are very knowledgeable about Class A coaches and share a great wealth of information on recommended upgrades. Join the Rambling Vegans as they take long road trips in their 2014 Airstream 16 foot Bambi Sport (which, by the way is a super small, yet cute travel trailer...it looks like a bubble!) They've been photographers, nature lovers, and vegans since 2006. You might even find out how to make Dorito popcorn from their blog! They also have 7 pets which enlighten their lives. They have traveled 20 states and are looking forward to seeing more. Join Mark and Emily and their adventures as they RV and sail a boat. RVing and sailing make their adventures unique from other RV bloggers. They take incredible photos of their adventures from sea to land! Mark and Emily have also put together many resources for those who are just starting out, whether you're RVing or cruising! Mike and Jennifer from Roadtreking.com live quite the adventure. Mike is an award winning journalist and a great story teller. His experience in that world as brought great value to his blog. They travel in a 2013 Roadtrek exploring the national parks and wilderness areas. Boon-docking is also one of their favorite types of RVing. This blog is about great stories, information and inspiration. Since 1993 the author has been RVing after a modest success in remodeling homes, renting and selling. However, in October of 1993 she was in a hot air balloon accident damaging her spinal cord and putting her in a wheelchair. She has not let that bring her down. She now runs her blog, helping others in her situation navigate the challenges of traveling in a wheel chair. Roger Marble over at RV Tire Safety focuses his blog on the more technical side. Roger has spent a good portion, almost 40 years in the tire industry. If you have any questions regarding the safety of your RV tires, Roger is the guy. Julianne G. Crane has been a RV enthusiast and writer for many years. She writes about RV and camping lifestyle, peoples and destinations. She is also the columnist for MotorMatters.biz for their RV lifestyle section. Living on a limited income while still enjoying a satisfying retirement is not always easy. Bob Lowry gives advice and tips on how to live a satisfying retirement. He offers detailed posts on his experience with social security, investments, healthcare and more! While not a full time RVer...yet...he and his wife of 37 years do enjoy taking trips in their Class C motorhome. Cherie and Chris write for their active blog, Technomadia. A Technomad is a technology enabled nomad. They travel in a bus that has been converted for living and both work from the comfort of their 'moving home.' They are a great wealth of information for anything to do with technology and traveling! The Bayfield Bunch consists of the adventurous Kelly and Al! They travel in their 2011 Winnebago Access Premier with their dog Pheebe. With over 600 fans and over 1 million page visits, the Bayfields share their RVing life through stories and photography. Their website is full of landscapes and animal nature photography. The Cheddar Yeti blog follows the lives of two people who gave up their 9-5 jobs for a more simplistic, deliberate life. Dennis and Jeanette share their trips of mayhem, offbeat travel and local foods all in their 1978 BlueBird Wanderlodge Bus. They support themselves through web development and design. The Democratic Travelers are by far one of the most unique RVers. Where they go is determines by their own fans! John Ellis, a web developer (check out their site, itu2019s very awesome) and Laura Preston, a food blogger, along with their dog travel in their 34 foot 1986 airstream travel trailer. They've been recognized by some pretty big people like Mashable and National Geographic. Roxi, for many years had been traveling in her Class A RV, The Duck, with her pets. Recently, she decided that the 'big rig' lifestyle wasn't for her and switch to a Prius! She shares some great resources on boondocking and healthcare for the poor. She even has a page with employment ideas while on the road. Roxi and The Good Luck Duck really know their stuff! Oh, and you DON'T want to miss all her great pictures! The bloggers over at The Fit RV help the world around them stay fit while on the road. If you read their story, youu2019ll find out that they didnu2019t even plan on the RV lifestyle, it more or less happened to them! Stef and James are both avid cyclists. James has done a beautiful job in remodeling their 2003 Sprinter. You have to see it! Brian and Maria love their beer. So much in fact that they bought an RV and roam around the country trying the beers of America. They've successfully created their own brand of clothing, books and homemade notebooks to help support their endeavors. They even have a Google map outlining everywhere theyu2019ve been or want to go! This blog is a bit different than a traditional RV Blog. Kent, over at Tiny House Blog showcases everything about small houses on his blog. While most of his posts include small cabins or tiny houses, some of them crossover into the RV realm. It's a fascinating site, and worth checking out. Glen has a great story. From living a simple life to making the LA Times, his road has been well documented on his popular blog. He's a musician, composer, and traveler. He's owned several different RVs and now travels in a 1988 Volkswagen Vanagon he restored himself. Vanessa is a runner, RVer and writer...oh and a photographer. She takes some great pictures of her travels. She has done very well with her book, The Summit Seeker on Amazon with dozens of 5 star reviews. She's written for numerous running magazines and has successfully finished 4, 100 miles runs. The Watsons are another 'airstream renovation' family! I love a good renovation story. Tim, Amanda and their pet dog Phineas. Fueled by their desire to travel and find all those quaint little towns and beautiful sunsets, they sold their possessions and set out on an adventure they would never forget. Nina over at WheelingIt write one of the most informative blogs on RVing. They were the inspiration for one of our in-depth blogs on boondocking. Most of their time is spent boondocking, so they have tons of information on the subject. They even share their adventures of getting dental work done in Mexico and how to go 'shampoo free!' She travels with her husband, 2 cats, a dog and a nice big Class A! Where RV Going is a family of five who enjoy the great outdoors from Utah to Washington in their 25 foot travel trailer. David and Carley, along with their three boys were also recently picked as 'RVers of the Month' by RV Resources. They do product review, give tips for the road, and tell about their adventures from RV parks to campgrounds and beyond.